Transfusion of red blood cells (RBCs) is a requisite cell therapy today, while RBCs supplied by donors cannot match the huge demand of patients. 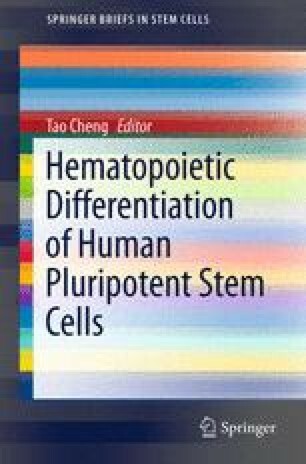 Human pluripotent stem cells (hPSCs) are promising cell sources to obtain RBCs as an alternative transfusion product for clinical application. Several in vitro culture systems have been reported that in which mature erythrocytes can be efficiently generated from hPSCs. However, different efficiency and maturity of hPSC-derived erythrocytes could be obtained when using different culture systems. We still lack a complete understanding of the regulatory pathways controlling human erythrocyte development and maturation, especially the origination of erythrocytes early in the embryo and enucleation at the terminal stage of differentiation. In this chapter, we focus on an efficient method established successfully in our laboratory to derive functionally mature erythrocytes from hPSCs by coculture with mouse fetal stromal cells [aorta–gonad–mesonephros stromal cells (mAGM) and fetal liver stromal cells (mFLSCs), respectively]. The procedures to investigate the characteristics of these hPSC-derived erythrocytes are also introduced, including colony formation assay to detect the hematopoietic potential, flow cytometry assay to detect the phenotypic expression pattern, and immuno-staining assay of the Hb components to evaluate the maturity. At the end of this review, several future prospects are also be addressed in this research fields.